When a law firm has the proper team of lawyers, paralegals, and associates, it can mean happy and productive employees, improvement in clients’ lives, and ultimately increased success. We have all heard of these “A Teams” of staff that work well together and are invested in the success and growth of the firm. However, as the executive, owner, or head attorney, how do you hire and develop the right team? With so many applicants, how do you filter through to find and establish the best staff member for the firm? 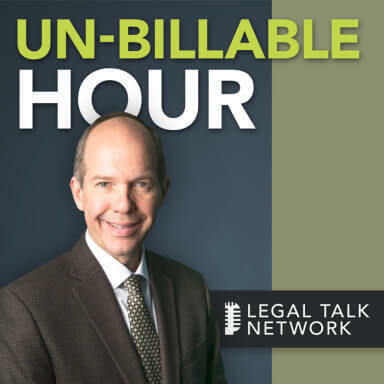 In this episode of The Un-Billable Hour, host Christopher Anderson interviews Broel Law Group founder Erik Broel about what it means to build an “A Team,” how attorneys should hire and train their staff, and the underlying qualities of becoming a successful leader. Broel suggests that lawyers chart out and develop a position clearly before beginning recruitment. As resumes come in for the position, he says, it is best to create a series of tests for problem solving, attention to detail, temperament, etc. in order to filter through many applicants. Through the interview and selection process, Broel talks about the job, his law firm’s culture, and discusses how the position will improve the candidate’s life. In this way, the person hired is already invested in the improvement of the firm itself. Becoming this type of leader takes a lot of work, but it is worth the time and energy spent. Make changes one step at a time, Broel says. Erik Broel founded Broel Law Group LLP in 2009, focusing exclusively on estate and trust administration and litigation. He sees it as his personal mission to demystify the process of handling an estate or trust, and to help people by making the complex estate process simple and accessible. He believes there is always a better way to do things, and loves finding new and innovative ways to deliver better, more effective service that solves the client’s key problem or issue, and improves the client’s life. Broel believes that developing the right team of lawyers, paralegals, and associates has helped him grow a successful firm. Advertiser: Managing your law practice can be challenging. Marketing, time management, attracting clients and all the things besides the cases that you need to do that aren’t billable. Welcome to this edition of the Un-Billable Hour, the law practice advisory podcast. This is where you’ll get the information you’ll need from expert guests, and host Christopher Anderson. Here, on Legal Talk Network. Christopher Anderson: Welcome to the Un-Billable Hour, the law practice advisory podcast, helping attorneys improve their practices. We’re glad you can listen today on the Legal Talk Network. I’m your host, Christopher Anderson. I am an attorney with a singular passion for helping other lawyers be more successful with their law firms. I work directly with lawyers across the country to help them achieve success in their law firm business. I have built and managed law firms in Georgia and New York, created an innovative software for lawyers at LexisNexis, as well as served as a prosecutor in New York City. As an attorney, I believe you should have a law firm that works for you. In this program, I have a chance to speak to you, as I do in presentations across the country, about what it takes to build and operate your law firm like the business that it is. I have a chance to introduce you to a new guest each month, to talk about how to make that business work for you, instead of the other way around. In today’s episode of the Un-billable-Hour is building your A team, and my guest today is Eric Broel of the Broel Law Group in Atlanta, Georgia. Eric founded the Broel Law Group in 2009. He sees it as his personal mission to demystify the process of handling an estate or trust and to help people by making the complex estate process simple and accessible. He believes that there’s always a better way to do things, and loves finding new and innovative ways to deliver better, more effective service that solves the client’s key problem or issue, and improves the client’s life. Eric has built a thriving law business and his firm focuses exclusively on estate and trust administration and estate and trust litigation. He looks for what he sees is missing from legal industry or his firm and works to create it. In so doing, he’s also built a team of A team players. Outside of the office, Eric enjoys practicing kickboxing, reading good books, and playing with his two young children. He’s an avid UFC fan and lives in Marietta, Georgia, with his wonderful wife, children, and two dogs. We’ll be sharing some contact information for Eric and other ways to get in touch with him during the course of this show. And today, we’re going to be talking to Eric about why it’s important to build your A team. Eric has himself built a team of ten attorneys and support personnel. This team helps to propel his business towards the goals that he set for himself and for his clients. And that is why Eric believes that it is so important to surround yourself with people that propel your business forward. Welcome, Eric. Erik Broel: Hey Chris, thanks. I’m happy to be here. Christopher Anderson: Great. So let’s start off today with the title of the program. When we talk about what it means to build your A team, what do those words mean in the context of a small law firm? What do they mean to you? Erik Broel: I think building your A team really to me means surrounding yourself with a group of people that can help make the firm better, help make the service we deliver to clients better, and who really can help make their own lives better through what they do at the firm. If done right, when you have an A team, everybody involved in this whole process is better off as a result, and no one’s worse off. Christopher Anderson: Okay, so how does that help you achieve the goals of your business? What does the A team do for you so that you can be a better leader of your business? Erik Broel: One of the myths about hiring folks and building more of an organization is that it’s just going to be more work for me and that the people issues are going to be more work for me. And one of the great things about building your A team is that you wind up with a group of people that can operate independently and still make good decisions and still make the kind of decisions I might make. And so one example I can think of is that I was concerned initially as the firm started to grow because people would constantly come and ask me decisions, what to do in certain situations. I had people that could do things but then they would have to come to me for every little decision that had to be made, and so that could obviously get old after a while. And so this whole Idea of building an A team allows you to empower those around you to make those kind of decisions on their own and make good decisions and better decisions. And really, one of the great things about it is in our firm, in our practice, it’s allowed those we’ve hired to shine. And quite frankly, pretty much all of them do their job better than I did their job when I did it. Because since founding the firm, I’ve done every job that’s available in the firm. Christopher Anderson: That makes total sense. So what I think I hear you’re saying is that if you build a team of people who still need to turn to you for every level of decision, then that doesn’t really help to propel your success. But if you empower them to make decisions, as you said, the way you would make them, but in a way that they have more time to think about it or where they have bandwidth to make those decisions and the scope of the decision-making process is smaller. They can make the decisions better because they have more focus on them. Erik Broel: Yeah, I think so. And that’s part of what goes into this. This is a really big topic and part of what we’re leading into is one of the first things you have to do to build an A team is really define what positions exist within your firm. Because in order to hire someone into a position that you can them empower to be able to make decisions for you, you’ve got to know what role that position serves in the firm. That way, you can understand the way that this person’s decisions and the way that this person’s actions are going to affect the overall health of the business and health of the firm. For example, take a paralegal position. In our firm, we don’t separate between litigation paralegals and non-litigation paralegals. And a lot of times, our paralegals wind up primarily helping with uncontested situations and then assistant attorneys in litigation from time to time but the attorneys are way more responsible for the litigation. And so our paralegals get notes and little cards from clients all the time because the paralegals are there while someone’s going through this very stressful situation after they’ve lost a loved one, a spouse or parent. The paralegals are not only helping them settle the estate, but they’re just providing some emotional support. Not to the level of counselling or anything like that, but they call them “hug calls.” And so by helping even our paralegals understand, this is the mission of the firm. This is what we’re about here. They’re now making decisions when a client has something going on in their life that yes, a family member of a client goes to the hospital or the client may have to go to the hospital for a procedure or something; the paralegals are empowered to send flowers and do things like that that can make a client’s day brighter. And that reflects on the firm’s reputation and it generates more of a positive image in the client’s mind of their interaction with our firm and that’s what we want at the end of the day; we want to be making a difference in people’s lives. Christopher Anderson: So you said it’s important for you to have really clear in your mind to clarify what that role will do for the firm and how they will service the business. How do you clarify that? Do you create any documents? Do you create any rules so that you have a really clear idea of what each individual rule is going to do for you? Erik Broel: Yes, and I’ll tell you. One of the first things that we had to do when we started down this path is create an organizational chart. And it sounds like a small thing, not a big deal. I didn’t want to do it when it was proposed to me; I thought it was a waste of time. I wound up doing it and that tool has served me very well. And so when we did the organizational chart, we actually created every position that exists in the firm. Even if my name winds up in a whole bunch of boxes. And what that helped me do is really see visually. All of these jobs are getting job, and then for each box on the org chart, I just defined what I think that job’s supposed to do. It’s not anything elaborate, it wasn’t anything elaborate, it’s like a few bullet points on a piece of paper. This is generally what this job is supposed to do to help the firm. Once I had those two pieces that really were talking about a half a day maybes worth of sit down and write it out and map it out, building the A team become easier because then I could define, well, what kind of person do I need to do this kind of job well. And so that takes us to the next step of recruiting. Once we define the positions, then we’ve got to say alright, what does an A team player look like in this kind of position. And so since I defined it, it was much easier for me to start to develop my idea of who that could be. Christopher Anderson: Right, and I think a lot of people do it quite differently. They need a receptionist, they need a paralegal, so they put an ad out that says, “Law Firm Needs Paralegal.” And then they get resumes from everybody who thinks they might possibly could do the job of paralegal. What you’re saying is because you’ve clearly identified what that role’s going to do, you get an avatar -if you will – of who it is you’re already looking for, so it’s so much easier to recognize them. Christopher Anderson: Is that one of the bullets that you would write down when you did your org chart, like, “in this role we need someone who’s going to help our clients have a better day”? Erik Broel: Yeah, that would be exactly it. I’m not a super technical guy where I’m trying to get an HR manual out and figure out how this would be done in an HR or Fortune 500 situation. I just wrote down from my mind, well, my paralegal has to help someone have a better day. They’ve got to be warm, they’ve got to be friendly, we’re going to have them filling out petitions. So they have to be detail-oriented, they need to pay attention to the details, catch things that attorneys will sometimes let slip through the cracks and things like that. When I’m talking about descriptions, it’s that simple. Christopher Anderson: Then you use this – like you were just saying – for recruiting, and in that way you recognize the people that match the avatar that you’ve created. How does this then go towards helping them understand what their role is once they come onboard? Christopher Anderson: Yeah, so talk about that, what does that process look like? Erik Broel: Yeah, so for example, I like to create tests when we’re recruiting. And I’ll usually have someone do something like spell their name backwards in an email just to see if they’re detail-oriented if it’s a detail-oriented position. And then I’ll have them answer a question. And I made up one question once like the paralegal position. We have a client that’s out of state, they need to take their oath out of state. You call the out of state judge, Georgia law allows this, you call the out of state judge, the judge tells you no; what do you do? And so we’re testing their temperament, their problem-solving ability, and then I can read their answers. It really starts to help me weed through some folks and that’s a real-life job skill question because we run into that scenario on a somewhat-frequent basis. And sometimes you get the person that says, “Oh, well I would just tell the judge what the law is and argue with them.” We know automatically they’re probably not going to be successful in the position. And so that helps us start to hone down our list so we interview less people. So this doesn’t become this big monster of trying to sift through a haystack to find a needle. So that helps with recruiting. Now your question was once we start onboarding, right? Christopher Anderson: Actually to your point I think you’ve hit it on something cool because we’ve already identified now two really key things at having A team players and recruiting for an A team help you with. The first one was to reduce the number of decisions you have to make while ensuring that great decisions are being made. Which is one of the fears that I hear about when I talk to other attorneys about needing to hire and leverage staff for their firms is that I’ve done that before and all they do is bother the heck out of me and it’s just easier to do it myself; so this process that you’re talking about seems to solve for that. And the second thing that a lot of people talk to me about is, oh my god, I put out an ad and next thing I knew I had three thousand resumes and I just got buried. And the whole process of hiring was so annoying and so arduous that it wasn’t worth doing. And by building that avatar and understanding who you’re getting, you have fewer resumes coming in. So your job is easier and you’re also wasting less people’s time who don’t fit that job. You’re actually being kinder to the possible prospects by sending the wrong ones away. Erik Broel: I don’t want to say we get less resumes; we still get a ton of them. But it helps us weed through them is probably the way that I’d put it, simply because it becomes a process. I can look at the subject line of the email; if they didn’t follow that instruction, we move them to the eliminated box, then I look at the next step. We asked you to write this answer to this question in the text of the email. Well, if that doesn’t look like the right fit, they go to the eliminated box. If that works, then we open the resume, then we start. So we haven’t even looked at the resumes until we’re down to a small percentage of total candidates. Christopher Anderson: Right, and this also is starting to sound like a process that you can also delegate to somebody else, that you could actually use somebody that works on your team to get the pile down to the member that you actually want to see. Erik Broel: Yeah, that’s absolutely right. Those first two steps, if you create your ideal scenario. Obviously the last name spelled backwards, that’s easy; they either did it or they didn’t. In terms of the answer to the question, if you ask a job-related question and then you map out a few different possible scenarios, you could delegate that to someone else. And what really works is after you’ve hired that position one time, you’re going to get a really good feel of all sorts of different answers people will come up with. You can copy paste some of those, put them into a rubric, delegate that to a staff member, and all of a sudden, that staff member’s going to do the sorting for you. You’re empowering them, making their life better, giving them some higher-level job skills depending on who in your staff you give it to. And then you, the attorney, the owner, are handed a ten, twenty maybe, total candidates that you’ve got to go through; not three-hundred. Christopher Anderson: That makes total sense. Alright, when we come back, we’re going to take a break now to hear some messages and when we come back we’re going to talk about onboarding and training and a little bit about leadership; how leadership plays into this building of your A team. So we’ll be back in a moment. Advertiser: You can advertise with us at Legal Talk Network and have your own commercial play on this podcast. Just send us an email at [email protected]. We’re glad you’re listening to Legal Talk Network. Check us out on Facebook, Twitter and LinkedIn too. Christopher Anderson: And we’re back. Eric, when we left off we were talking about how to apply some methodologies around building your A team to the recruiting process. And so now I wanted to bring that into you’ve done the recruiting process, you’ve whittled them down, you’ve identified the people who match the skills and the demeanors, et cetera, that you’ve listed down on your org chart; now you’re making them a part of your team. How do some of these concepts that you’re talking about apply to the onboarding process? Erik Broel: So once we’ve whittled down and we decide to make an offer, the onboarding process is actually a lot easier. Because through the interview and selection process – we didn’t even touch on interviewing – but through the interview process, the conversation I’m having in the interview is talking to them about this job, obviously. Can they do the job, do we kind of match personalities, do I feel like we can get along, are they going to fit our firm culture, and are they going to fit in with the way our firm does things. But we’re also looking at how can this job help you improve your life. Because my philosophy is that in everything that our business does, we need to be and I want to be improving the lives of those around me. So if I can’t figure out how this job can improve your life, then I can’t really expect you to help me improve my firm. And so through that conversation, we’re discovering things about you and about where you’re at and where you want to go. So when we got to onboarding, the person we’ve hired is already bought into this whole idea. They want the job, they see where the job can take them, and they’ve bought into the firm mission because we’ve already talked about firm mission, firm culture and things like that. So now we’re simply down to technical, how-does-the-IT-system-work type training that they just need to learn. And so the onboarding process becomes a lot easier. Christopher Anderson: That makes a lot of sense and it also sounds like you have a much higher likelihood of bringing someone on board who’s going to meld into your team rather than become a burr under the saddle. This seems to avoid bringing in that toxic personality or the person who’s just not going to really jive with the way the rest of your firm operates. Erik Broel: Certainly. This isn’t a magic bullet. We’ve certainly had bad apples but I’ll tell you, I’ve done it both ways. I’ve done it the traditional way where you just throw an ad out and you do a bunch of interviews and you go with your gut, and then I’ve done it this way, a more systematic way. And the number of bad apples is drastically less under the second way. Christopher Anderson: Cool. So does this apply or have anything instructional for you when you think about that in training? You mentioned that it really becomes now, in the onboarding process, about nuts and bolts. But when I’m talking about training I’m not talking about that initial training but ongoing. How does this build in your A team apply to how you bring training and new skills into your team in general? Erik Broel: I think it’s based on where the firm wants to go. I don’t want to go too far into left field, but part of it is making a decision and setting our goals for where we want the firm to go in terms of growth and in terms of what we want to do for our clients and how to benefit our clients. And then we look at that and we look at the different people we have on board, and we try to match skillsets. There’s a philosophy of management that I subscribe to called management of walking around. It’s kind of hard to describe but basically there will be times in the day where I just walk around and talk to people. And I just listen. We talk about what’s going on in the office, we talk about their families a little bit and I observe and I listen. And as silly as it sounds or as simple as it sounds, that gives me an enormous amount of information about what’s going on in my organization. And it also kind of clues me into who’s interested in what and who wants to grow to help the firm more, who’s happy where they are, and things like that. It just really comes down to getting to know people and showing you care. Christopher Anderson: That makes a lot of sense and that is a great segway into what I wanted to ask about also which is so we talked about training to help the firm and to help them become more valuable to the firm. But when you were first talking about the recruiting process and the interview process, one of the things you mentioned was understanding where they wanted to be in the future. What were their goals? How would working with you help them meet their life goals. What do you do on a continuing basis to make sure you’re constantly reevaluating that and making sure that the firm is working for them or isn’t? Erik Broel: So in our firm, we’ve adapted a practice where we do quarterly reviews. In those, they’re quarterly employee reviews and what those meetings are, is they’re broken into a couple of different segments. One, we’re looking at past performance. How did you do against the goals we set at your last quarterly review or midyear, how are you doing, how are you tracking towards the goals we all agreed on that you were going to go after for this year, depending on the position. We’re also evaluating them on a number of skillsets that are applicable to their position and we’ve got a rating system from one to five where we do that. And then we’re just talking and saying how are things going, how are you doing, if they’re under goal, what’s going on here, we try to dig into how we can help them. It took me a little while to get this, the first instinct is usually – for some people, for me, certainly – was what’s going on, why are you not meeting your goal? How can I light a fire under you to get you to meet this goal. And I’ve kind of tempered that. And now it’s operating on the assumption that they want to do a good job so what can I do to help you do the good job? Do you need additional tools, do you need additional training? Now, if it continues to happen after we’ve attempted to do that, then I’ve got to change my assumption to this person may not want to do a good job and I might need to make a change here. But going into that initial assumption puts me in the frame of mind of what tools do I need to get to you or training to help you do the job the way that we would like to see the job done. Christopher Anderson: Cool, and that makes a whole lot of sense and that keeps you in touch with where they need to be going as well. And that again is another good segway into what I wanted to talk to you about because these skills that you’re talking about don’t necessarily come naturally, I wouldn’t suspect. Erik Broel: They don’t, I was born with it. Christopher Anderson: And there’s something about being the leader of an A team that’s as key. These are all great processes and procedures and ways of doing things, but I think that you’ve just described it in one of the things you said about how you have to come to those review meetings with a different mindset. With your mind, with your demeanor being in a place of being helpful and trying to solve their problem, not your problem necessarily. If it doesn’t solve your problem in the end, of course that isn’t the solution you’re looking for. But so how do you get to be that kind of leader? How do you learn about building an A team and how can our listeners understand more about that? Erik Broel: There’s one really neat resource. There’s a book out there that’s really good on this kind of stuff. It’s called The 5 Levels of Leadership by John Maxwell. And he does a really good job of breaking down leadership into 5 different areas, or 5 different levels. And so that was really helpful to me because in order to really start building the A team and think about growing people versus managing people; leading people versus managing people. It takes, first, a change in the mindset of the leader to do that, or to the head of the firm before you’re going to be able to do that. Because the people that are working for you, my people didn’t just pop up one day and say hey, we’ve decided we’re going to be an A team. And so it doesn’t work like that, it takes a lot of work on the firm leader’s part. Christopher Anderson: Yeah, and I had an opportunity to review Maxwell’s book and he levels of leadership that he talks about makes a whole lot of sense and I think our listeners would recognize them, I’ll review them really quickly. The first is position. You’re the boss, therefore people have to listen to you. The second is permission where it’s based on relationships. You’re a nice guy. you’re helpful, you’re nice, you ask people about their day and how they’re doing, and they follow you and they do things because they like you. And that gives you certain capabilities, a little bit more leadership capabilities but really doesn’t get your team to the level that you need them to be as far as being a productive and contributory team. The third level is, in fact, production where the leader then gets in, rolls up his sleeves, and helps the team understand how to do the work by getting in there and doing the work with them. And they see you as an example and they follow your example. And then there’s level four leadership which is people development where the leader starts to focus more on developing other leaders in their organization. Other level 3 leaders and other level 2 leaders and not getting in there and doing the work all the time with them but rather focusing more on developing the leaders. Erik Broel: Let’s go through that again because the way I define production is not getting in there and rolling up your sleeves, it would be more by your leadership and the decisions you’re making and the way you’re helping folks, you’re getting results that are helping them. You’re producing results that are helping them, helping the organization and they’re following you because they’re seeing the results that you’re able to produce. Christopher Anderson: That’s absolutely right, that’s a much better way to say it. Production is getting down with the team but it’s leading them to show them how to be better producers, that’s a much better way of saying it. So level three production is about getting in there with the team and showing them how they can be better producers. Helping to develop producers among your team by giving them the tools, by giving them the resources, by giving them the example. Sometimes that example in fact being used, sometimes that example being other examples so that they could become better producers. And then level four leadership is what I like to call reproduction. What Maxwell I think calls people development, but where you’re actually reproducing yourself. You’re reproducing leaders in the organization that can give those levels of leadership. How does this apply to building the A team? How do you apply these levels to building the A team? Erik Broel: So first, we can work from the bottom up. I don’t ever want to be a positional leader, or that be my only leadership style. Because if you work up, you never lose a level. I’m always the boss, my name’s on the front door. I’m always the boss to everybody there. And so I always have that positional leadership, but I don’t want to fall back into relying on that in the conversation being, “You just need to do this because I said you need to do this,” and it being that kind of situation. When we talk about the recruiting, my goal through the recruitment process is to start with someone at a level two. And I guess I need to back up a little bit because when you’re looking at these leadership levels, you’re not a level four leader or a level three leader period across the board. It’s by individual, really, if you want to look at this the right way. It’s like me to my paralegal, me to the senior attorney in our firm. What leadership level am I on with that person, and it’s really their perspective of me that determines that, not my perspective. And so my goal when onboarding a new person is to skip phase one if I can, and the way I want to do that is through our interview process. Remember we talked about we’re focusing on what they want, how the job can help them, showing them the future that whatever they’re doing at the firm and what the firm is going to be compensating can help their life. By the time they start on their first day, I want them to feel like I care about them. I want them to feel like the firm cares about them and that I’m already at a level two of permission lever leader with them where they’re following because they like me, they like what we’re about. It’s going to take a little time in their job, depending on the role, before I’m able to go to level three and show them that the results of my decisions are producing things. With level three, my goal in moving to level three with someone is that by following my lead, or following my leadership, that they’re starting to see some results that we talked about in the interview that is helping their life. And then we’re going to evolve into level three. They’re not going to come to you and say alright, now on my checkcard, we got past level one, now we’re level two, we’re moving into level three. This is part of that management by walking around, it’s just checking folks’ temperature. Getting to level four is hard, and that’s really not going to happen with everybody, at least in my experience. Because I’ve really got to reproduce myself and that’s a pretty good investment that I have to make in the person, quite frankly. And so that’s really for my key players on my team, at least at this point. Those are the folks that I want to grow into captives. The senior attorney in our firm that heads up our legal department. Our firm administrator that’s heading up all of non-legal operations. Those key players on our team that I want them to grow into leaders. Your department heads, so to speak, that are going to be leading people in their own rank. When you’re talking about reproduction, I really want to take the time with them that’s necessary to grow to that level. Christopher Anderson: Yeah, that makes a lot of sense. I think Peter Drucker said it really well: “Executives who do not make the effort to get their people decisions right, do more than risk poor performance, they risk losing their organization’s respect.” And it sounds like by focusing on this level three and level four leadership – as you’ve said for the people you want to make key investments in – you do a lot to maintain your position as leader of that organization by earning your organization’s respect by being the kind of leader that they need in order to achieve the goals that they set for themselves. Erik Broel: And I’ll just tell you, Chris, and I’ll tell your listeners; this stuff is not easy. It’s hard work. Everything we’ve talked about is hard work, but it’s worth it. For a long time I didn’t do it, I was very process-based. We develop a process, we’re going to do this and we’re going to do this and do this, and I would ignore the human element to a large extent. Well, you’re in this position, the title is paralegal, paralegals do this so you need to go do that. And I was basically using positional leadership, maybe mixed in with some permission leadership because I’m a nice guy and I would ask them about their families. But I think by doing this work – and I would tell everybody go read this book so you could really get in depth because we’re not really scratching the surface about what Maxwell talks about here. But by understanding these things on a deeper level, it’s still hard work, but it makes it so worth it because then when the team needs to pull together and when the business needs a team member to go out of the way to go above and beyond, you start seeing that happen more regularly and the team starts making better decisions. And you walk into the office and instead of coming back from vacation and being barraged or coming back after taking a long weekend and the office is still open, being barraged with, “Hey, we’ve got this going on with this client, that going on with that client, this client’s having a billing issue, what do we do Chris?” It’s, “Hey, Chris, so we had the Jones case, there was this thing going on, here’s what the senior attorney did on that; we think it’s going to work out this way. We had the Smith case, she called in to question some of our charges but we handled that, I think she’s going to be fine, we were able to walk through it, this is what happened there.” It becomes more of, “I did this and now I’m reporting it to you.” Or, “Hey Chris, we had Ms. Smith call in, she’s questioning her bill. I see a couple scenarios here, I think we could do this or we could do that or we could do the other thing. This is why I think we should go with option B because I reasoned this out and I thought about it, what do you think? Can I have your permission to go down and do option B?” That’s a whole lot better than, “Hey, Chris, Ms. Smith is freaking out, I need help, tell me what to do.” It creates a much better environment for you as a leader and it allows everyone to get a lot more done. Erik Broel: Exactly, and you know, not everyone’s going to get to every part of that scale depending on their position in the firm. Your receptionist may not ever get to, “You don’t need to know,” right? But certainly your higher-level leaders that you’re growing, the folks that you’re going to level four with, you’re going to get to a point of, “Hey, this happened, I did it, you got any problems with that?” Or you don’t even find out half of the problems that are happening or half of the challenges because they’re just solving them and that’s a wonderful place to be. Christopher Anderson: As we’re getting ready to close, I want to just address one last thing. I can certainly see when I was younger, beginning leadership in my own law firm, these concepts and doing this seem cool but unachievable. There’s no way I could get there in any reasonable amount of time. What does it take to start to lead and build an A team in this way? Erik Broel: I think you take it one step at a time. We’re still building and we’re still trying to get this stuff right. We’re still messing this stuff up on a daily, weekly, monthly basis and just trying to get better and better and better over time. I would say continuous improvement. Don’t think you’ve got to instantly become this so then it becomes this completely overwhelming thing, “Oh my god, I have to change all of my hiring practices, I have to fire everybody that’s there because I didn’t hire them under that method, I’ve got to change my training method, I’ve now got to do these quarterly review things, I’ve got to come up with all these different skillsets for different positions, and I’ve got to read this book and I’ve got to figure out where I am-” don’t do that. Take any one of these suggestions. Really, honestly, it almost doesn’t matter where you start with this thing. Whatever speaks to you or whatever you feel like, hey, that sounds like the coolest idea that I’ve heard in this podcast, start there. Implement something little. Then, implement another little thing, then implement another little thing. Just pick any part. You know, every person’s business and law firm is going to have different challenges. So it’s very hard for me to say you’ve got to start at step one and then go to step two. You’ve got to look at your situation. Where are you having fires? If your fire is you’ve got a bunch of folks coming and asking you decisions all the time and this and that, then it’s probably going to be, hey, let’s look at Maxwell’s book. Let’s start figuring out how can we start empowering our people to make better decisions. Maybe some management by walking around and just checking in with folks. If you’re at a position where you’re ready to hire your first person, your very first associate or your very first paralegal or whatever, then maybe it’s looking back at this whole hiring methodology and just implementing a few of the things we talked about. You don’t have to build out that entire system the first time. We sure as heck didn’t have the entire system the first time, this has been an ongoing work in progress. So my advice is just take one or two little suggestions, try implementing them. Then come back to this recording, take another one or two simple suggestions, implement them. That’s the way you actually get this stuff done instead of listening to it, thinking it sounds awesome, wanting to do all of it, but never actually getting anything off the ground. Christopher Anderson: Yeah, that makes a whole lot of sense. Erik, thanks so much. This wraps up this edition of the Un-Billable Hour, the law practice advisory podcast. Our guest today has been Eric Broel, at Broel Law group LLC in Atlanta, Georgia. You can learn more about him at www.GeorgiaProbateFirm.com. Eric are there any other contact places where you’d like people to reach out to you? Erik Broel: Yeah, I’m always happy if folks send me an email. You can reach me at [email protected]. Christopher Anderson: Great, and of course, these links will be available on the Un-Billable Hour’s webpage on the Legal Talk Network. So that’s it, my name is Christopher Anderson and I look forward to seeing you next month with another awesome guest. Remember that you can subscribe to all of the editions of this podcast on LegalTalkNetwork.com or on iTunes. Thanks for joining us and we’ll speak to you again soon. Advertiser: The views expressed by the participants of this program are their own, and do not represent the views of, nor are they endorsed by, Legal Talk Network, its officers, directors, employees, agents, representatives, shareholders, and subsidiaries. None of the content should be considered legal advice. As always, consult a lawyer. Thanks for listening to the Un-Billable Hour, the law practice advisory podcast. Join us again for the next edition, right here with Legal Talk Network.